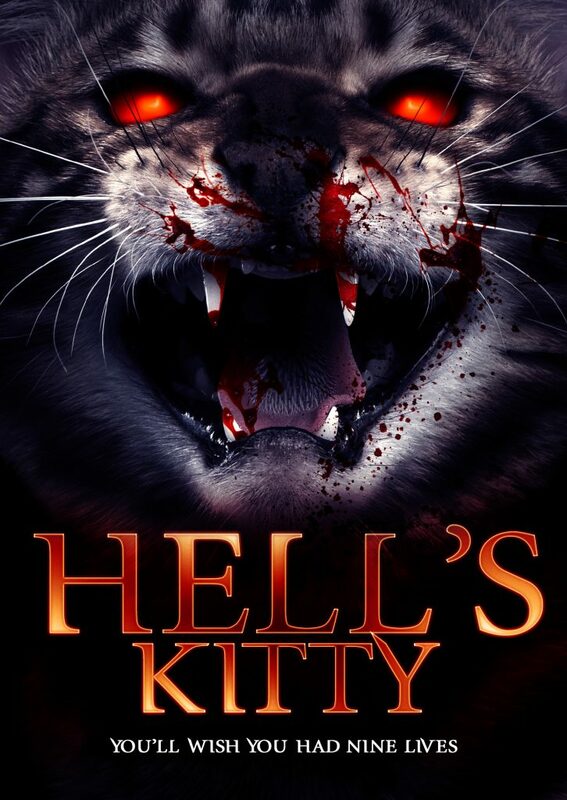 Enter HELL’S KITTY (hitting VOD today and DVD March 27), an over-the-top, supernaturally infused spoof in which a demonic presence supercharges those aforementioned innate traits in a seemingly innocent housecat: Angel, here portrayed with blasé malevolence by the late feline…Angel. This has grisly implications for the already floundering love life of her owner, struggling Hollywood screenwriter Nick (writer/director/star Nicholas Tana). As previously seen in a web series and comic book, Tana’s approach here is essentially a mashup of the SCARY MOVIE franchise, SATURDAY THE 14TH and the mumblecore aesthetic. As with those spiritual forbearers, to call HELL’S KITTY uneven would be a considerable understatement. In truth, many of the gags and punchlines feel better suited to short episodic bursts and sketches than the sort of full-blown narrative a feature treatment requires. That said, a steady stream of hammy, frothy cameos from legit genre names—Michael Berryman, Lynn Lowry, Adrienne Barbeau, Doug Jones, a Killer Klown, John Franklin and Courtney Gains (CHILDREN OF THE CORN), Kelli Maroney (NIGHT OF THE COMET), Barbara Nedeljakova (HOSTEL), Ashley C. Williams (THE HUMAN CENTIPEDE), Dale Midkiff (PET SEMATARY)—add a level of…well, let’s not get carried away and call it “gravitas” or anything. But there’s definitely a kind of genius in enticing such names into the cast of what is essentially a nutty homage to ’70s/’80s horror starring the filmmakers’ cat. Further, the setups for the guest stars’ individual sequences are sly enough to signal a true-blue love of genre. Is a string of increasingly weird mini-premises, a steady parade of familiar faces and a cute if blood-spattered cat enough to carry a film? For most, probably not. It’s easy to imagine even a fan of recent lowbrow heavy-on-the-comedy horror-comedies like, say, BAD MILO and HELL BABY walking away from HELL’S KITTY disappointed or annoyed if they went into the experience expecting anything other than a bizarro novelty skating along the edge of breezy, sketchy goofiness in sometimes endearing, sometimes half-baked, occasionally tedious ways. Approach the film as an exceedingly improbable, epic oddball love letter to a pet, on the other hand, and it’ll more likely stroke a purr or two out of you. “Do you believe in the devil?” Nick asks Mordicia (Gains) and Isaiah (Franklin) when they arrive at his home promising salvation from eternal damnation. “Why do you ask, my son?” Isaiah replies. Yes, Mordicia. Yes, they are.